[Kansas City, Missouri] GK Callahan and Laura White have become fast friends, they met at an art class for the blind and visually impaired. GK was about to start a large-scale community art project, and he needed a partner, someone who understood and reflected the community, Laura was just that person. Laura who is an artist herself has worked as a graphic designer and taught at both the Kansas State School for the Blind and Children’s center of visually impaired, unbeknownst to GK at the time she was in need of a project. 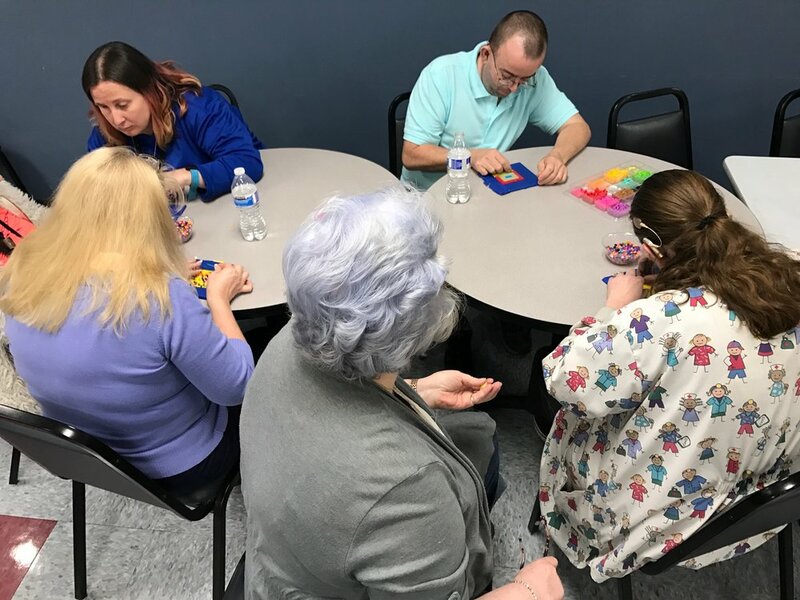 Laura had left teaching and taken some time off to deal with both her vision and hearing loss; it was a perfect pairing…Together they have begun the ambitious journey to create the Kansas City Beaded Quilt mural. This mural will be the second community-based mural made out of beads Callahan has created with the blind and visual impaired community. The first Beaded Quilt Mural is located in San Francisco, CA, at the LightHouse for the Blind and Visually Impaired, and was installed June 2011. Callahan helped created the 8 x 8-foot mural out of 150,000 colored fuse beads, which took the community over a year and a half to create. Callahan and White plan on making the KC Beaded Quilt mural MUCH larger than the first; their plan is to make a 10 x 9-foot mural using roughly 450,000 beads. Not only will this process impact more blind community members than in San Francisco, because they are involving multiple nonprofits, they also hope the artwork and its message will also reach a much broader audience by the sheer size and number of beads it will take to complete. The nonprofits involved are Alphapointe, Kansas State School for the Blind, and The Whole Person, they are also working with several apartment complexes that house folks with visual impairments. 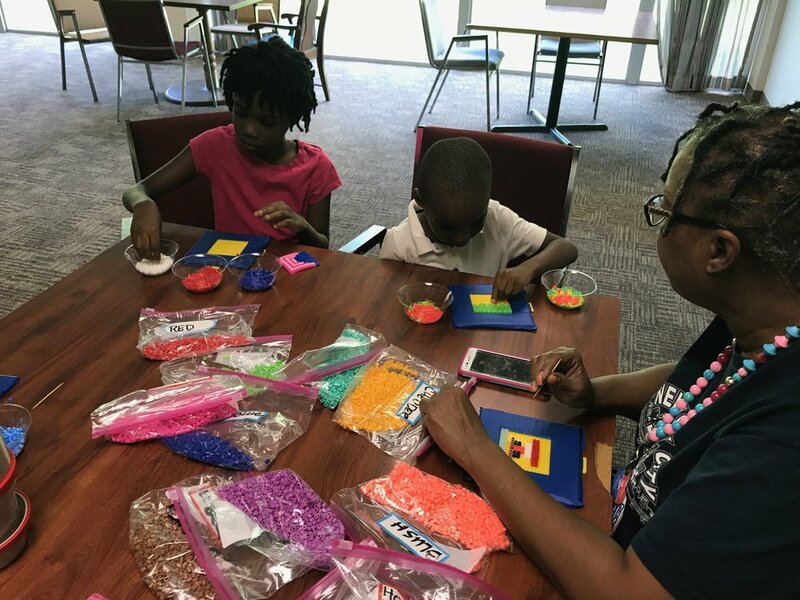 For this project, the beading process is as important and significant as the end product; the time spent in what they are calling “beading circles” is a great form of art therapy, storytelling, and communing in a group setting. Callahan has found that making the mural echoes the relationship to the communal tradition of American quilt making. At the same time, the making process helps to fine-tune the makers’ manual dexterity, improve their hand-eye coordination, memory, and their color and shape recognition particularly in those who are visually impaired. The mural will be made up of a textural beaded grid of squares which symbolically highlights the colorfulness and diversity of the blind community, while demonstrating their togetherness to work on such a large project over a lengthy span of time. Callahan and White are estimating it will take around two years to complete; they are a good six months into the project. They both hope the mural will become a beacon of education for the greater KC community. The Beaded Mural illustrates how art made by people with disabilities does not remain at the level of crafts or outsider art. 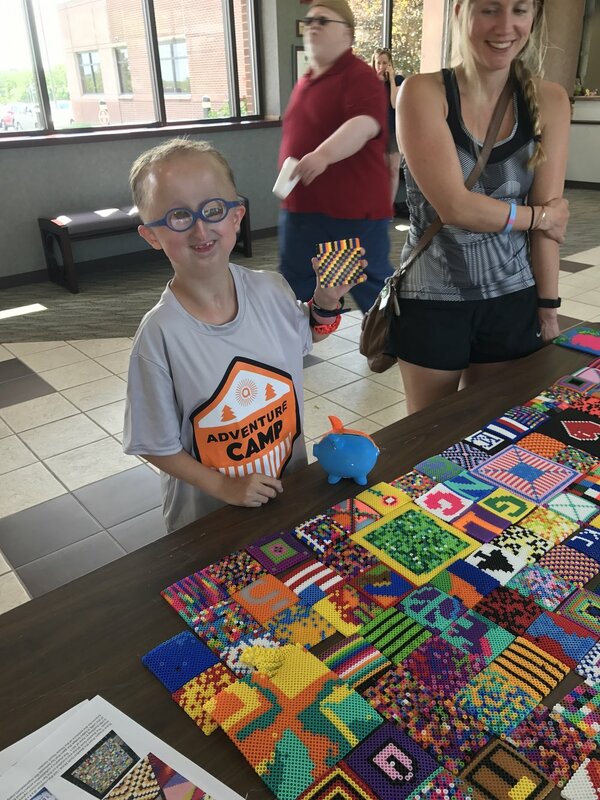 The Beaded Quilt-Kansas City will be created as a contemporary public art installation and as a statement about what one with disabilities can accomplish.